Mahayana Buddhism was introduced to the Korean peninsula from China in the fourth century C.E. As in many countries that adopted Buddhism, the religion was first practiced and supported by elites, the royal courts and the aristocracy, but gradually it was adopted by all levels of society. By the late sixth century, Korean monks were traveling along the trade routes to China and even to India to receive training. They returned home bearing texts and images that played a decisive role in the formation of Korean culture and art. Buddhism flourished until the Choson dynasty (1392 – 1910), when Neo-Confucianism became the state ideology. Buddhism, however, remained a spiritual force in Korean society, and private devotional objects and works for monasteries and temples continued to be made throughout the centuries. Large-scale banner paintings (Fig. 1), for example, were popular during the seventeenth and eighteenth centuries, when Buddhism was more widespread, in part because of the loosening of government prohibitions against it. The size and iconography of this painting suggest that it came from a worship hall of the highest level of sanctity, that is, one that enshrined an image of Shakyamuni Buddha. A major, long-established East Asian route of trade and influence ran from northern China down the Korean peninsula and across the Korea Strait to Japan. Traveling along this route, Mahayana Buddhism was introduced into Japan from Korea in the sixth century (traditionally, in either 538 or 552), as part of a diplomatic mission that included gifts such as an image of Shakyamuni Buddha and several volumes of Buddhist texts. 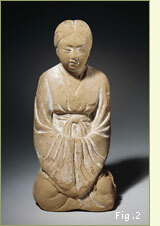 As in Korea, the religion had a lasting effect on the native culture; today, Buddhism is the dominant religion in Japan. 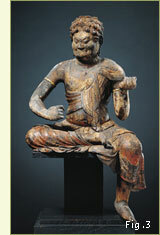 As Buddhism prospered there, related arts also flourished. By the seventh century, when the religion was firmly established, Japan had dozens of temple complexes, various orders of priests and nuns, and a body of skilled artisans to craft the icons and other accoutrements of faith needed. During the eighth century (Nara period, 710 – 94), Japan was part of an international trading network that linked it with such distant countries as India and Iran, although the strongest cultural and artistic influences still came from China and Korea (Fig. 2). Japan's cosmopolitan nature at this time is illustrated by the eye-opening ceremony in 752 of a large bronze image of Roshana (Mahavairocana), the supreme Buddha. The statue was housed in the main hall of Todai-ji in Nara. The hall was built for the statue and is still the world's largest wooden structure, the Buddha's eyes were painted in by an Indian monk, an event that was witnessed by roughly ten thousand priests and numerous foreign visitors. Vajrayana (Esoteric) Buddhism, and its attendant pantheon of deities, was introduced to Japan in the Early Heian Period (794 – 894) by a number of Japanese priests. They studied the religion in China and returned home to found influential monasteries, two of which became the centers of the two main Japanese Buddhist sects, Tendai and Shingon. Images of wrathful deities, such as Fudo Myo-o ("Immovable Wisdom King") (Fig. 3), were introduced at this time as part of the Vajrayana Buddhist pantheon. Fudo Myo-o's dark skin, fierce expression, fangs, and bulging eyes indicate his power to vanquish all demons. In the Late Heian Period (894 – 1185) and in the following centuries, Pure Land Buddhism became very popular. The salvationist Pure Land Buddhism taught that faith in Amida (Fig. 4), the Buddha of the Western Paradise, and the diligent recitation of his name enabled the soul to be reborn in a heavenly Pure Land rather than in a Buddhist hell or other undesirable rebirth. Intense devotion to Amida produced voluminous requests for Buddhist statuary and painting in addition to the many temples dedicated to him. 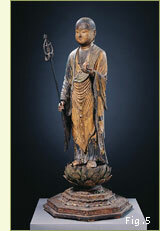 Another salvationist deity popular at this time was Jizo, who had been introduced to Japan centuries earlier as a bodhisattva in the Mahayana Buddhist pantheon (Fig. 5). Jizo is a deity of compassion and benvolence whose powers expanded as time passed. By the time of the Kamakura period (1185 – 1333), when the Asia Society's image was created, Jizo had the guise of an itinerant monk who gave succor to children, mothers, and travelers. 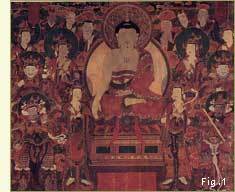 It was during the Kamakura period that Buddhism became the faith of all people of all classes. This was due, in part, to the many priests who became itinerant evangelists and brought Pure Land Buddhism to the masses.